In What a Hoot, the star is a cute owl, the game looking like it’s dedicated to these creatures of the night. The game is also a Microgaming title, so you can count on getting decent graphics from it. It doesn’t do as well on the feature front, but more on that below. The number of lines, along with the feature list, will tell you that it’s one of the older slots in their portfolio, but the design is still quite good. With What a Hoot, you’re getting 9 lines arranged on 5 reels. The prizes will go as high as $25,000 and the game also offers scatters and wilds as features. The game’s only two features are a scatter symbol and a wild, with nothing else triggered by them. The wild symbol would be the first one to talk about, as it will often be responsible for prizes being awarded, and you need all the help you can get in a slot machine with only 9 lines. The wild substitutes for any regular symbol, with the scatter being a feature icon, so it doesn’t benefit from those powers. There are no prizes awarded by the wild, it can only help you get some from other symbols. The scatter symbol is the other feature you can get in What a Hoot. You will find that it uses the image of a jar filled with fireflies and that it can appear anywhere on the five reels of this slot. No matter if they are on the same line or not, these symbols will reward you with prizes by taking into account how many of them are present in the game. For three to five Jars with Fireflies you will get prizes worth between 2 times and 50 times the total bet. You can only use one coin for each line, but you are free to change the denomination as you need, as long as it’s within the $0.25 to $5 range. 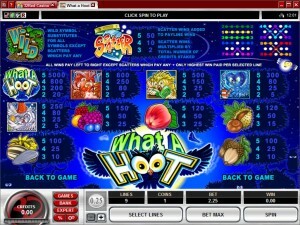 A maximum bet of $45 can be used by the slot. 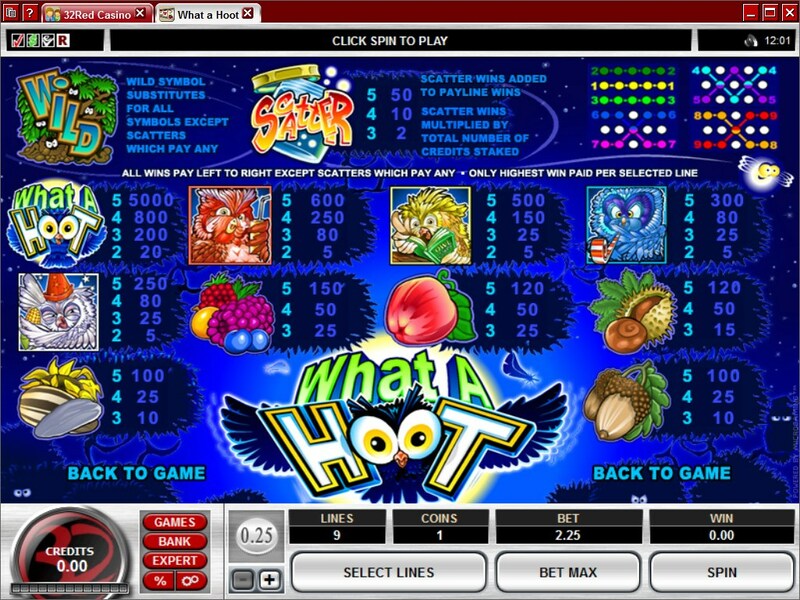 You can win 5,000 coins in What a Hoot, and depending on the denomination you used in the bet that can mean up to $25,000. 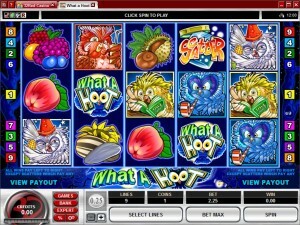 The title works for this slot machine in more ways than one, being a hoot and also being about owls. They’re quirky little creatures in this game, reading, drinking, doing wizardry or partying. The rest of the symbols will show you some of the things that they will eat. You don’t get to see much of the background, but you can guess that it’s an image of a forest at night. Symbols: Bush (wild), Jar with fireflies (50x the bet, scatter), What a Hoot Logo (5,000 coins), Red Owl (600 coins), Yellow Owl (500 coins), Blue Owl (300 coins), White Owl (250 coins), Berries (150 coins), Apple (120 coins), Chestnut (120 coins), Sunflower (100 coins) and Acorn (100 coins). The design of the game makes it easy enough to enjoy, but the limited number of features will make a lot of players give up on it fairly quickly. 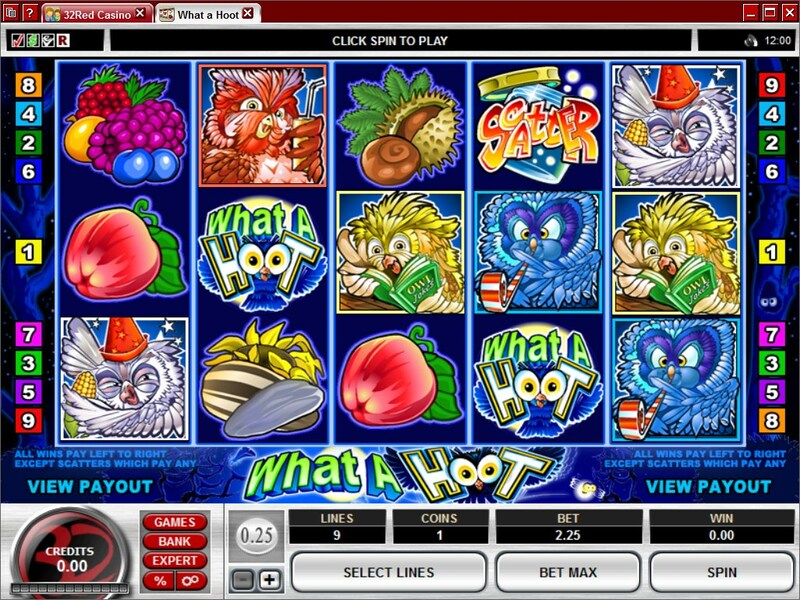 This What a Hoot slot is offered by all online casinos with Microgaming software, playable either in practice or in real money mode.